KTH provides open platforms for research, demonstration and education in sustainable transportation, specifically for connected and autonomous transport. 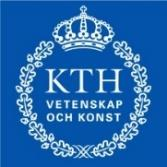 The work is led by the KTH Integrated Research Transport Lab (ITRL). 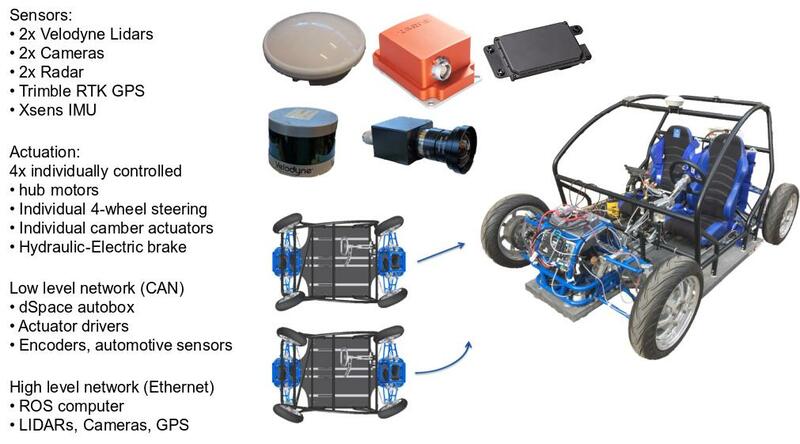 We here focus on the KTH Research Concept Vehicle (RCV), see Fig. 1. The RCV constitutes an open (available designs), evolving and experimental platform (it is used for experiments by KTH researchers and with partners). Past activities for the RCV include participation in the Grand Cooperative Driving Challenge, applications of fault tolerant control, sensor based autonomous driving in on-road and parking scenarios, remote driving with haptic feedback to driving simulator seat, and energy efficient control strategies using over-actuation. The RCV exists in two versions; the basic RCV as depicted in Fig. 1, and the RCV-E, as depicted in Fig. 2. The RCV-E represents a modified version of the basic RCV, developed by KTH and Ericsson in collaboration. The RCV-E is designed for Connected and Automated Transport with a suitable size for first and last mile type of vehicles. It is equipped with 5G connectivity, has essentially the same actuation as the basic RCV with more powerful in-wheel motors, but with no camber actuation. Current work in progress at KTH includes integrating multiple planners for higher automation levels, safe maneuvers (actions at e.g. sensor failure), and semantic segmentation of sensor input. Further planned activities include motion planning for autonomous parking, utilizing four wheel steering (short term) and deployment and evaluation of dependable computing platforms. Access to the RCV will be granted according to agreement with KTH, depending on nature of experiments. KTH currently has 2-3 RCV’s at disposal. The access will also depend on the planning of other activities and experiments. Regarding tests and data collection, we have access to a relatively nearby test track at Arlanda (some 60 km’s from KTH). For tests requiring 5G infrastructure, we have access to the Connected Mobility Arena in Kista (just north of Stockholm). Specific agreement with Ericsson is needed for such tests. A further option is to make use of the AstaZero test facility (however this is much further away, Gothenburg area) and requires separate funding.